DINA MERI 90E ECONO STOOL: DINA MERI has helped develop the anti-fatique stools. Each one is designed to provide different levels of support allowing you to work more comfortably for a longer period of time. 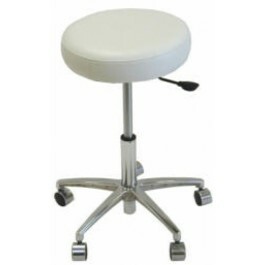 Stool features: Heavy duty metal frame construction. Padded seat is 15" diameter in durable white vinyl covering. Five star chrome base (for more stability). Five dual wheel casters, fixed to the base foot ring. Chromed gas lift mechanism with 5" height adjustment.